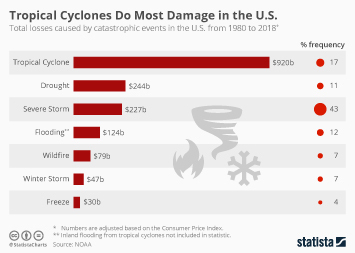 The sheer size and geographic diversity of the United States means that the country experiences a variety of different natural disasters on a frequent basis. Rather than just an extreme natural event such as a hurricane, a flood or an earthquake, a natural disaster is characterized by a great deal of damage and/or loss of life. The most destructive natural disaster in economic terms in the United States was the storm on August 29, 2005. Known as Hurricane Katrina, the storm sent shockwaves around the nation and the world. Outsiders watched the devastation unfold before their eyes through their screens, prompting. While the damage done on the day was catastrophic, a slow governmental response resulted in a long lingering financial burden for many of those who lost most of what they had to Katrina. Material property and economic damage can cripple a city such as New Orleans. However, if given the choice, many people would trade their possessions to revive their love ones lost to natural disasters. Sadly, many such deaths often occur in a more mundane but equally as lethal set of natural disasters. Heat and cold waves can exasperate conditions among children, the elderly or those already ill. Such events can also prove more deadly to those from lower socio-economic backgrounds as some lack the means to afford air-conditioning or heating in their homes. The most deadly of such events being a heat wave that stuck Kansas City, Missouri and St Louis in 1980. Other disasters are less deadly but claim their disaster tag through the sheer number of people they affect. Flooding across the Midwest in June 2008 affected more than 11 million people, the most people affected by a natural disaster in U.S. history. While it is often the horrors of death that gather the widest media attention, government support and intervention is often just as necessary in less lethal cases. Although many natural disasters are impossible to contain, the battle against wildfires in the United States frequently rages on. As the area of acres burnt due to wildfires from 2000 to 2016 shows, more than 3.4 million hectares is lost yearly. Unfortunately, that is a good year with more than 10 million acres lost in 2015. Number of earthquakes in the U.S.